Little is known about how primary care physicians (PCPs) in routine outpatient practice use paid price information (i.e., the amount that insurers finally pay providers) in daily clinical practice. To describe the experiences of PCPs who have had paid price information on tests and procedures for at least 1 year. Cross-sectional study using semi-structured interviews and the constant comparative method of qualitative analysis. Forty-six PCPs within an accountable care organization. Via the ordering screen of their electronic health record, PCPs were presented with the median paid price for commonly ordered tests and procedures (e.g., blood tests, x-rays, CTs, MRIs). We asked PCPs for (a) their “gut reaction” to having paid price information, (b) the situations in which they used price information in clinical decision-making separate from or jointly with patients, (c) their thoughts on who bore the chief responsibility for discussing price information with patients, and (d) suggestions for improving physician-targeted price information interventions. Among “gut reactions” that ranged from positive to negative, all PCPs were more interested in having patient-specific price information than paid prices from the practice perspective. PCPs described that when patients’ out-of-pocket spending concerns were revealed, price information helped them engage patients in conversations about how to alter treatment plans to make them more affordable. PCPs stated that having price information only slightly altered their test-ordering patterns and that they avoided mentioning prices when advising patients against unnecessary testing. Most PCPs asserted that physicians bear the chief responsibility for discussing prices with patients because of their clinical knowledge and relationships with patients. They wished for help from patients, practices, health plans, and society in order to support price transparency in healthcare. Physician-targeted price transparency efforts may provide PCPs with the information they need to respond to patients’ concerns regarding out-of-pocket affordability rather than that needed to change test-ordering habits. The online version of this article (doi: 10.1007/s11606-016-3805-0) contains supplementary material, which is available to authorized users. Fully trained primary care physicians (PCPs) with experience having and using paid price information at the point of care are uniquely able to shed light on how physician-targeted price transparency efforts work in contemporary outpatient medical settings. PCPs can provide their views regarding the price information they have received, the type of clinical scenarios in which they do and do not find price information useful, and the role that physicians versus other actors within the healthcare system should play in price transparency. In this qualitative study, we describe the experiences of PCPs who were given paid price information for a minimum of 1 year. Among price-informed PCPs, we describe their (a) “gut reaction” to having paid price information, (b) the clinical scenarios in which they used price information in clinical decision-making or patient conversations, (c) the degree to which they felt physicians should be involved in having conversations about price with patients, and (d) suggestions for improving physician-targeted price information interventions. We conducted a cross-sectional qualitative study using semi-structured interviews. We received Boston Children’s Hospital institutional review board approval for this study and obtained oral consent from all interview participants. Our study was conducted within Atrius Health (Atrius), a large multispecialty medical group consisting of over 35 practice locations in eastern and central Massachusetts. At the time of our study, Atrius’ over 517 adult PCPs delivered care to nearly 400,000 unique patients annually. About 90 % of patients were from white racial/ethnic backgrounds; 79 % were commercially insured. Approximately half of the contracts in which Atrius was engaged were risk-bearing, which equated to half of their patients, and their leadership reported a high level of focus on their capitated business. Atrius began providing its physicians with paid prices for commonly ordered laboratory tests in 2011 and for imaging studies and procedures in January 2014 (screenshots in online Appendix).3 The goal of Atrius’ initiative was to provide physicians with paid price information without adjunctive clinical decision support or patient education materials. The intent of the intervention was stated in the paper and email communications that Atrius used to introduce this program to physicians. For each price-revealed test, Atrius calculated single median paid prices from all the risk-bearing commercial, Medicaid, and Medicare contracts that Atrius had in the year prior to the initiative. Between August and December 2014, we conducted 30–45-min in-person interviews with MD and DO-licensed internists and family practitioners functioning as PCPs. We recruited PCPs from 18 eligible adult primary care sites within Atrius. Given the variability in patient populations (e.g., 7–40 % on Medicare or Medicaid) and primary care practice group size (e.g., 3–22 PCPs), we sought to interview a representative sample, with a goal of 2–3 PCPs per site. We recruited PCPs first via email and then through Atrius’ internal paper-based and electronic messaging systems. All interviewees had been employed by Atrius for at least 1–2 years and had been given paid price information for a minimum of 1 year for commonly ordered lab tests and a minimum of 8 months for commonly ordered imaging studies and procedures. We began by verifying the degree to which PCPs were aware of the price information they were given. We then asked PCPs for (a) their “gut reaction” to having paid price information, (b) the situations in which they used price information in clinical decision-making separate from or jointly with patients, (c) their thoughts on who bore chief responsibility for discussing price information with patients, and using probes, (d) their suggestions for improving physician-targeted price information interventions, along with the frequency with which PCPs were having conversations involving price and the degree to which PCPs felt professionally obligated to place primacy on patients’ interests, medical professionalism, their practice or organization, and society at large. We audio-recorded and transcribed the interviews for all except two participants, who preferred having a notetaker. Two interviewers (ATC, KHS) conducted all interviews. We analyzed semi-structured interview transcripts using grounded theory and the constant comparative method of qualitative analysis to identify themes in responses;43 we created a codebook for our analytical approach, which involved cycling between three phases of open and closed coding. During the closed-coding phase, we checked inter-rater agreement among our coders (к = 0.73) prior to adjudication through discussion. Two study team members double-coded all interviews, and two others served as independent adjudicators if consensus could not be reached. We examined whether findings seemed to differ based on PCP demographics (e.g., age, gender, training) or clinical role (with or without administrative duties). We used Dedoose and Excel software to support our analysis. Our site response rate was 83 % (15 of 18), and our PCP response rate was 85 % (46 of 54). Slightly more than half (N = 27, 59 %) of the interviewed PCPs were female, 96 % (44 of 46) of PCPs practiced internal medicine and 4 % (2 of 46) were family practitioners, and PCPs had completed residency an average 22 years ago (SD 10, range 3–43 years) (Table 1). Most PCPs (N = 39, 85 %) reported being engaged in direct patient care at least 2.5 days per week (range 0.5–5 days), and one-third (N = 16, 35 %) reported having administrative responsibilities (e.g., unit chief) in addition to providing patient care directly. Seven key themes emerged from the interviews (Table 2). 1. PCP “gut reactions” to price information ranged from positive to negative. 2. PCPs with all ranges of “gut reactions” were interested in having patient-specific price information. 3. Having price information only slightly altered test-ordering heuristics. 4. When patients’ affordability concerns were revealed, price information helped PCPs engage patients in conversations about how to alter treatment plans. 5. PCPs avoided mentioning price information when advising patients against unnecessary testing. 6. PCPs felt that physicians bore chief responsibility for discussing prices with patients because of their clinical knowledge and relationships with patients. 7. PCPs wished for help from patients, practices, health plans, and society in order to support price transparency in healthcare. All PCPs recalled seeing price information. When asked about their “gut reactions” to having paid price information for use during clinical care, over half of PCPs (N = 26, 56 %) responded that they viewed having such information positively, about one-third (N = 14, 30 %) viewed the availability of this information more neutrally, and the remainder (N = 6, 13 %) had a negative reaction. Examples of statements that were considered positive, neutral, and negative include the following: “clinicians were asking for the [price] information”, “[the price information] was no surprise,” and “I felt the [price information] was a waste of time,” respectively. Most PCPs (N = 27, 59 %) rebuffed the idea that having price information changed their test-ordering habits, citing that they were already parsimonious (e.g., “I’m very minimalistic when I’m ordering”) or that the main driver of their test-ordering behavior was evidence-based medicine rather than price (e.g., “I tend to be kind of evidence-based. I don’t order a bunch of stuff that I’m not supposed to order”). However, over a quarter of PCPs (N = 13, 28 %) reported small changes in their ordering habits (e.g., “[when] all [patients] need is a creatinine and a potassium [then] that’s…more cost effective [than a basic metabolic panel]”). The vast majority of PCPs (N = 43, 93 %) described having recently or increasingly discussed price information with patients (e.g., “I’ve had more of these conversations with patients over the years as copay[s] have gone up and as now deductibles are going up”), and two-thirds of PCPs (N = 31, 67 %) also stated that they found price information useful for patient conversations. Half of PCPs (N = 22, 48 %) described using price information simply in a price-informed conversation. At times they described providing patients with ballpark estimates (e.g., “Patients don’t know [prices] at all. So it is just helpful to be able to say, ‘It’s going to be under $100’”). Other times, PCPs described the identification of alternate treatment approaches like watchful waiting, a substitute test, or a medication trial. One PCP described, “Some patients are choosing probably not to have something that I might have been interested in or that isn’t maybe totally necessary…We’ll decide, what out of these possibilities, do we think we really need to get? What are you willing to pay for?” About one-third of PCPs (N = 16, 35 %) described ways in which they would use patient out-of-pocket price information if they had it (e.g., “If I knew exactly how much it would cost a person to do a test like that would be very useful, to both [me and my patient]”). Most PCPs (N = 28, 61 %) considered cost stewardship an important part of their role as physicians (e.g., “[I feel] responsible…to society for keeping costs down”) and conveyed a high level of frustration when faced with patients who demanded tests that were not clinically indicated (e.g., “The patient wants it ordered or will freak out if you don’t order”). In situations in which PCPs felt that adhering to patient requests were in conflict with medical evidence and cost stewardship, PCPs expressed fear of eroding patient rapport and described avoiding rather than incorporating price information. For example, one PCP explained, “I wouldn’t necessarily bring [price] up because patients feel that they’re not getting the best care…they might think that all I’m doing is trying to save money, which is not the case.” PCPs also related that they wanted to emphasize the clinical indications for testing (e.g., “It’s more helpful to put it in contexts of medical necessity”). A majority of PCPs (N = 37, 80 %) stated that physicians bore the chief responsibility for discussing prices with patients, or affirmed that there “wasn’t any way for physicians not to be involved in conversations about price.” Some PCPs were emphatic about physicians playing an active role (e.g., “We’re the ones doing the ordering, and we’re the ones making the compromises when the finances are a problem or trying to figure out the alternatives or arguing with the insurance companies when they turn stuff down…[it] is our ethical responsibility”). Other PCPs were reluctant (e.g., “I don’t love having the [price] discussion…I do have to own some of that, and while it may be uncomfortable, it may also help [patients] in their decision-making”). Irrespective of the degree to which PCPs embraced their role in helping patients make price-informed decisions, they described their responsibility stemming from their clinical knowledge base (e.g., “[We] are the only ones with the expert knowledge of what is and isn’t appropriate”) and their relationship with patients (e.g., “There is no one else because we’re the ones giving the care and ordering”). One-third of PCPs (N = 18, 39 %) wanted patients to be better educated consumers (e.g., “In an ideal world, people should know what their insurance covers and what it doesn’t cover before they go into something”). One-quarter (N = 13, 28 %) also thought that other members of their practice’s clinical team or administrative staff could help introduce the idea of considering cost and could provide educational material to patients (e.g., “It would be great if there was a little office of how to help you with the cost of your medical care right here”). One-half (N = 23, 50 %) strongly stated that health plans could better align with PCPs’ efforts (e.g., “[physicians] have these difficult conversations with patients…to try to reduce the duplication. Then, to have patients be able to call [insurance companies] up and be told ‘All you need to do is have your doctor do a referral,’…[it] is very frustrating for a lot of clinicians”). Finally, about one-third of PCPs (N = 14, 30 %) stated that society had a stronger role to play in promoting price transparency (e.g., “In this country it has always been ‘more is better’ and ‘spend, spend, spend,’ and ‘somebody else is paying for it.’ Well, somebody else really isn’t paying for it, and we’re all paying for it. I think it’s a real education for the consumer”). We observed no differences in views based on PCP demographics (age, gender, training) or clinical role (with or without administrative duties). Although PCPs express a substantial amount of fear and hesitancy when considering whether to incorporate price information into clinical conversations, they still articulate being dedicated to the idea that physicians should play a central role in helping patients make price-informed clinical decisions. PCPs offer some practical solutions to overcome some of their own tentativeness, but most solutions involve broader stakeholder involvement (e.g., non-physician practice members could help gauge patient interest in price-informed clinical guidance, health plans could make patients’ OOP spending obligations more accessible), so further study of stakeholder views are needed. Our findings may be more generalizable than they initially seem. Although we interviewed PCPs at a large multispecialty group taking on risk-bearing contracts in MA and listed in the first wave of the Centers for Medicare and Medicaid Services Health Care Innovation Awards,44 , 45 these types of organizations are proliferating across the U.S. Observations among our PCPs may be similar to what may emerge from physicians in analogous situations across the nation.1 , 44 – 47 Certainly, our findings will also remain relevant if patients continue to face cost-sharing burdens in both fee-for-service and risk-bearing settings. More work will need to be done in order to understand how price transparency efforts may work in settings where patients are non-white or not commercially insured—settings in which patient out-of-pocket spending concerns are likely to be greater than those in our study population.48 Social desirability bias is typically a concern for qualitative studies, but it is difficult to tell what direction that bias may have taken in this study—PCPs may have underreported their response to price information because they may have wanted to avoid the appearance that they were influenced by price information, or they may have overstated the degree to which they took price information into account because they wanted to appear value-oriented. Those interested in developing the next generation of physician-targeted price transparency efforts will benefit from recognizing that organizations face incentives from insurers and also create information environments for PCPs, and that PCPs may prefer to use price information to support patient-centered decisions rather than as a strategy for eliminating waste from healthcare, either for their organization or for the system at large.49 Developers will also undoubtedly benefit from the increasing availability and sophistication of consumer-oriented websites and smartphone “apps” that are moving toward providing patients with timely and accurate price information, including out-of-pocket spending obligations.1 To meet this interest, however, it may be necessary to provide physicians with additional information or training on how to be good price-informed guides to patients. Stakeholders interested in reducing waste in healthcare may want to consider the adjunctive training or clinical decision supports that may need to be combined with price transparency to achieve a waste reduction effect. 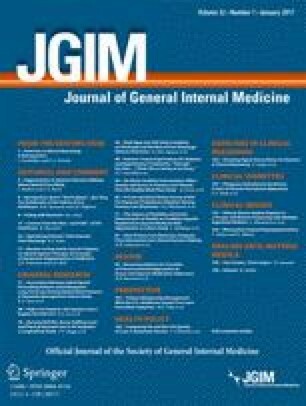 In summary, at least from the eyes of the price-experienced physicians we interviewed, the future of physician-targeted price transparency interventions in medicine likely lies more in the ability of such interventions to facilitate conversations between physicians and their patients about patients’ out-of-pocket spending burden than in changing physicians’ ordering patterns. We appreciate the assistance provided by our organizational partner for this study, Atrius Health, with respect to participant recruitment. This work was financially supported by the Robert Wood Johnson Foundation Health Care Financing Organization. The sponsor had no role in the design or conduct of the study; the collection, analysis, or interpretation of the data; or the preparation, review, or approval of the manuscript or the decision to submit. 2015 Society of General Internal Medicine Annual Meeting. Dr. Thomas D. Sequist is a member of Aetna’s Racial and Ethnic Equality Committee. All other authors declare that they have no conflict of interest. Hamel L, Norton M, Levitt L. Survey of non-group health insurance enrollees, Wave 2. Henry J. Kaiser Family Foundation. http://kff.org/report-section/survey-of-non-group-health-insurance-enrollees-wave-2-methodology/. Accessed 12 June 2016. The Henry J. Kaiser Family Foundation. 2015 Employer Health Benefits Survey. http://kff.org/health-costs/report/2015-employer-health-benefits-survey/. Accessed 12 June 2016. Centers for Medicare & Medicaid Services. Health care innovation awards round one project profiles. Baltimore, MD; 2013. http://innovation.cms.gov/initiatives/Health-Care-Innovation-Awards/Project-Profiles.html. Accessed 12 June 2016. Centers for Medicare & Medicaid Services. Health care innovation awards round two project profiles-wave one. Baltimore, MD; 2014. http://innovation.cms.gov/initiatives/Health-Care-Innovation-Awards/Round-2.html. Accessed 12 June 2016. Centers for Disease Control and Prevention, National Center for Health Statistics. National ambulatory medical care survey: 2012 Summary Tables. 2012. http://www.cdc.gov/nchs/data/ahcd/namcs_summary/2012_namcs_web_tables.pdf. Accessed 12 June 2016. Consumer Reports. Choosing Wisely campaign brochures. http://consumerhealthchoices.org/campaigns/choosing-wisely/#materials. Accessed 12 June 2016.